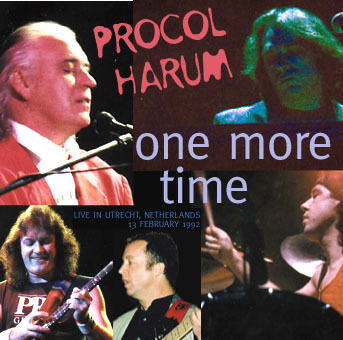 Procol Harum, whose classic hit from 1967, A Whiter Shade Of Pale, was recently voted one of the best singles of the 20th century, reformed in 1991. After a 14-year layoff Gary Brooker got together again with Keith Reid, Matthew Fisher and Robin Trower and they made a new album called The Prodigal Stranger for Zoo Records. Among the musicians who helped out on this album were Tim Renwick (guitar), Dave Bronze (bass) and Mark Brzezicki (drums). So when Procol Harum started their Prodigal Stranger Tour in September 1991, it was no surprise that these three pros were added to the line-up, Brzezicki having the unenviable task of following up the highly-rated BJ Wilson, who had tragically died in October 1990, and Renwick replacing Trower who was unable to perform due to previous commitments. The first part of their reunion tour took place in Canada and the USA and kicked off in Toronto on 23 September. The set contained seven songs from the new album. According to Ira Band in the Toronto Sun Gary Brooker had lost none of his vocal charisma and the high point was the passionate A Salty Dog. After this 11-city tour, which finished in Los Angeles Variety Arts Center, Gary Brooker and Matthew Fisher guested on the David Letterman Show. For the next leg of their Prodigal Stranger Tour Tim Renwick was replaced by Geoff Whitehorn, who made his début with the band on Johnny Carson's Tonight Show. On 15 January 1992 the European part of the tour began in the Augsburg Kongresshalle. After Germany the tour went on to Denmark, Norway, Sweden, Poland and Austria. After their return to Germany for one more performance (Frankfurt Music Hall) Procol headed for Utrecht. The Dutch had always had a soft spot for Procol Harum. In The Netherlands A Whiter Shade Of Pale reached the top of the singles charts twice, in June 1967 and July 1972. Homburg achieved that position in November 1967 and A Salty Dog was in the Top 3 in July 1969. It is no surprise that it was in Holland that Gary Brooker scored two solo hits with No More Fear Of Flying and Two Fools In Love. In a recent Dutch poll A Whiter Shade Of Pale was voted the best song of the sixties. Thanks to all the heavy touring, the band was in top shape for their Utrecht performance, nearly the last date of this European tour. It was their first concert in sixteen years in Holland and Gary & co. knew the gig was being recorded. The concert got off to a difficult start when due to technical problems Fisher's organ could not be heard on Conquistador. But after that it was full steam ahead. Just listen to the opening bars of Bringing Home The Bacon. Such dynamics, such power! This was a very well-rehearsed outfit, as is shown in the rousing Shine On Brightly and The Prodigal Stranger's One More Time, which features some inspired playing by Fisher and Whitehorn. Grand Hotel, the title track of their seventh album, proved to be another highlight. After the concert Geoff Whitehorn stated: "This was the best Grand Hotel we did on this tour." Listen to Brzezicki's timekeeping in Man With A Mission and the group vocals in The Devil Came From Kansas. Many consider The King Of Hearts to be the best track from The Prodigal Stranger and this version proves why. A highly-concentrated Brooker leads his troops like a true commander. Not a line missing and shining brightly on A Salty Dog. This Utrecht version was previously released on Castle's 1995 A Whiter Shade Of Pale re-release (as was the superb Repent Walpurgis, starring the genius of Matthew Fisher on organ). Whitehorn's interpretation of Trower's crunching power chords in Whaling Stories shows why rock superstars such as Pete Townshend and Paul Rodgers often ask him to join their touring bands. When listening to the rocky All Our Dreams Are Sold you hear a tight outfit, a great rock band with a lot of guts which is among the best in the universe. Of all the concerts Procol Harum did in the Netherlands since their first in October 1972 at the Concertgebouw in Amsterdam, this definitely was their best yet. Can you think of any other concert where afterwards part of the audience spontaneously started to shake hands with the members of the band?